Chili pepper (not to be confused with the country called Chile) is the fruit of a series of plants called Capsicum (nightshade family). Chilis are now grown all over the world, but originally, they came from Mexico. They are used as spices or as vegetables, and also have some use in medicine. Chile peppers are completely unrelated to the Piperaceae genus, which Black pepper is from. Chili peppers have been a part of the human diet in the Americas since at least 7500 BCE. Chili peppers were domesticated over 6000 years ago in Mexico. Since then, chili peppers could be farmed throughout all of Mexico, Central America, and parts of South America. The word "chili" is spelled differently in different countries. They can be spelled as chili, chilli, and chile. Chili is widely used in the United States and Canada. Chilli is widely used in other English-speaking countries. Chile is the most common Spanish spelling in Mexico and several other Latin American countries. 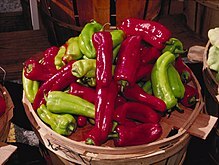 Wikimedia Commons has media related to Capsicum. ↑ Bosland, P.W. (1998). 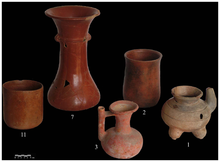 "Capsicums: Innovative uses of an ancient crop". In J. Janick (ed.). Progress in new crops. Arlington, VA: ASHS Press. pp. 479–487. Retrieved 23 December 2010. ↑ "chili" from Merriam-Webster; other spellings are listed as variants, with "Chili" identified as "chiefly British"
↑ The Canadian Oxford Dictionary lists chili as the main entry, and labels chile as a variant, and chilli as a British variant. ↑ "Fall in exports crushes chilli prices in Guntur". Thehindubusinessline.com. Retrieved 21 April 2012. ↑ "Chilli, Capsicum and Pepper are spicy plants grown for the pod. Green chilli is a culinary requirement in any Sri Lankan household". Sundaytimes.lk. Retrieved 21 April 2012. ↑ Heiser, Charles (August 1990). Seed To Civilization: The Story of Food. Cambridge: Harvard University Press. ISBN 0-674-79681-0. This page was last changed on 23 January 2018, at 05:29.